Rainforest Ginger is naturally extracted using only the finest quality Ginger rhizone in the world. Our Ginger is naturally cultivated in the pristine environment of the Ecuadorian Rainforest. Our Standardized True Spectrum extraction ensures the most potent Ginger extract available, concentrated in the balanced ration nature intended, without isolating, fractinonizing or using toxic solvents, harsh chemicals or gases. Ginger has been used for centuries to support many various digetive imbalances including indigestion, nausea and motion sickness. Research indicates many of Ginger's constituents also contain antioxidant and cardio-protectant properties. Ginger holds an important place in several traditional systems of medicine. Ginger originally came from China and India, where it has been used in cooking for more than 4,000 years. It was liked for its sharp and spicy flavor. Ginger rhizome is the knotted, thick tuber found at your local market. Because it grows underground, it is often called ginger root. The actual root sprawls out from the knots on the rhizome. Above ground are long stems with narrow, ribbed, green leaves and white or yellowish-green flowers. Ginger products are made from fresh or dried ginger root or stam distillation of the oil. Ginger has been used for centuries to support many various digestive imbalances including heartburn, indigestion, nausea, diarrhea and motion sickness. It helps relieve the dizziness, sweating, nausea and vomiting that comes from motion sickness and pregnancy. it can also ease sore throats, headaches, some types of menstrual and arthritis pain, and fevers and aches caused by colds and flu. It may also help to relieve symptoms of depression. 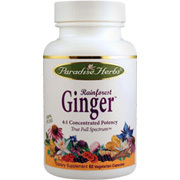 Research indicates many of ginger's constituents also contain antioxidant and cardio-protectant properties. Ayurvedic medicine incorporates ginger as a treatment for rheumatic patiens. Researchers at the University of Cleveland, Case Western Reserve University, Ohio suggest ginger as a preventative against skin cancer. Rainforest Ginger - is shipped in a discrete, unmarked package. Orders are processed immediately and usually take about 3 to 5 working days to be received. We do ask that you try it for 2 to 3 weeks to feel the full effects. Any information received is used only for order processing and shipping purposes. Your information, such as e-mail address, will never be disclosed to a third party.